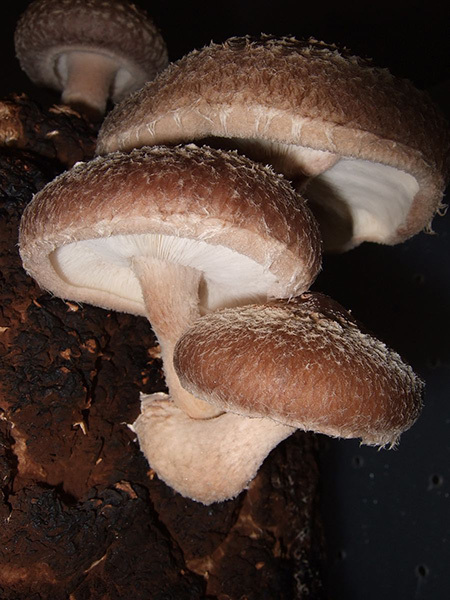 A group of Samford University faculty and students, along with students from other institutions, have demonstrated for the first time the ability of shiitake mushrooms to remove a common chemical pollutant found in wastewater. Their new article in the peer-reviewed journal Biocatalysis and Agricultural Biotechnology describes how the local, safe and edible shiitake mushroom secretes an enzyme that can break down contaminants into safe byproducts. This is important because current wastewater treatment methods do not adequately remove all contaminants, including estrogens from birth control pills, which can disrupt the proper function of hormones that control growth, weight gain and sexual function. Samford computer science alumna Hanna Chappell Eldridge ’15 initiated the project under the guidance of chemistry professor Denise Gregory. Gregory and chemistry professor Corey Johnson continued the work with the help of Lori Coward, a research associate in Samford’s McWhorter School of Pharmacy, current student Nils Wedland of Witzenhausen, Germany, and three students participating in the National Science Foundation’s Research Experience for Undergraduates (REU) program. The REU students, including Charlene Farmer (Judson College), Ar’Shundra Hampton (Miles College), and Alex Milliken (Wells College,) were impressed by the Samford professors’ expertise and genuine interest in their students. Milliken said the REU summer program at Samford allowed him opportunities to perform experiments and use techniques he would not otherwise have had. He praised the Samford professors for “their continuous support, patience and willingness to go above and beyond to help me in any and every way possible. This experience honestly changed my life,” he said.